10 Jacob left Beersheba and set out for Harran. 11 When he reached a certain place, he stopped for the night because the sun had set. Taking one of the stones there, he put it under his head and lay down to sleep. 12 He had a dream in which he saw a stairway resting on the earth, with its top reaching to heaven, and the angels of God were ascending and descending on it. 13 There above it stood the Lord, and he said: “I am the Lord, the God of your father Abraham and the God of Isaac. I will give you and your descendants the land on which you are lying. 14 Your descendants will be like the dust of the earth, and you will spread out to the west and to the east, to the north and to the south. All peoples on earth will be blessed through you and your offspring. 15 I am with you and will watch over you wherever you go, and I will bring you back to this land. I will not leave you until I have done what I have promised you.” 16 When Jacob awoke from his sleep, he thought, “Surely the Lord is in this place, and I was not aware of it.” 17 He was afraid and said, “How awesome is this place! This is none other than the house of God; this is the gate of heaven.” 18 Early the next morning Jacob took the stone he had placed under his head and set it up as a pillar and poured oil on top of it. 19 He called that place Bethel, though the city used to be called Luz. Jacob parting with his parents, and going to Padanaram as instructed by his father-Isaac was the son of Abraham and Sarah and father of Jacob (v. 1, v. 2), the blessing his father sent him away with (v. 3, v. 4), Jacob’s obedience to the orders given him (v. 5, v. 10), and the influence this had upon Esau – Jacob’s brother (v. 6-9). his vision of the ladder (v. 11, v. 12). The gracious promises God made him (v. 13-15). The impression this made upon him (v. 16-19). The vow he made to God, upon this occasion (v. 20, etc.). Verses 10-11 Jacob had God’s blessing. But Jacob had no money and he had no friends. He slept outside. He used a stone as his pillow. Verse 12 This staircase was between earth and heaven. So it was similar to the tower in Babel. But there were many differences. Men built the tower and they tried to reach heaven. They thought that they were clever. And they thought that they could be equal to God. 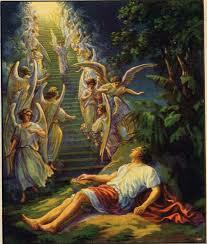 But in Jacob’s dream, God provided the staircase. In John 1:51, Jesus said, ‘Really and truly I say to you that you will see heaven open. And you will see God’s angels go up and down upon the Son of Man.’ Jesus is the way to heaven. Jacob needed to know that God was near him. God was not far away. Verse 13 ‘The Lord stood above it.’ This may be ‘The Lord stood above Jacob.’ Or ‘The Lord stood near Jacob.’ The word ‘above’ shows that God was controlling the situation. Abraham was Jacob’s grandfather. People often used the word ‘father’ to mean ‘ancestor’. God showed to Jacob that God was really blessing him. Jacob really wanted God’s blessing. In fact, Jacob had even used wrong methods to try to get it. But God gives his blessing where he wants to. We cannot earn it. Verse 14 God made the same promises to Jacob that he (God) had made to Abraham and Isaac. Verse 15 Jacob would return to this country that God had given to him. God would protect Jacob as he (Jacob) travelled. Verse 17 Jacob was not afraid that something evil would happen. That was not what he meant. He knew God’s almighty power. But in Jacob’s dream, he had seen God and he had heard God. God had promised great things to him. And Jacob realized how weak he was. Verse 18 Later, God did not allow the Jews to put up columns. That was because the Canaanites did that to worship false gods. But Jacob put up this one here. In that way, he wanted to remind himself and other people how great God was. And Jacob wanted to remember the exact place where he had this experience. Verse 19 The place was probably not a city until later. It seems that Jacob was alone in the desert. ‘Bethel’ means ‘the house of God’. Jacob gave this name to the place because he met God there. What are the ways God communicates to us? What do you think God liked about Jacob and how he was handling the situation? We are looking at three generations to see how God is living up to His promises – How does God continue this generation after generation? For 6,000 years, God has kept his promises – for some it was good news and some it was bad news. How would you explain this to someone? What do you think is the most important thing you can do to make sure the next generation knows God? There are some details that are in this Gospel only. These details show that they probably come from an eye-witness. In the account of the storm on the lake, ‘there were other boats with him’. Jesus was ‘in the back of the boat with his head on a cushion’ (4:35, 38). The groups of people were sitting on the ‘green’ grass (6:39). On the road to Jerusalem, Jesus was walking ‘ahead of them’ (10:32). Jesus ‘took the children into his arms’ (10:16). The blind man ‘threw off his coat’ (10:50). Some early writers also said that Peter gave Mark the information for his Gospel. Most theologians today agree that Mark was the first person to write a Gospel. Both Matthew and Luke seem to use it. Mark perhaps completed it in the year 65, soon after Peter’s death. This is always important when reading Gospels, they were written after Christ’s death and resurrection. The authors had time to see how the world had responded to Christ’s message and were writing to convince an apprehensive world. They were working for the Romans who were their enemies. They had to keep some money for themselves after they had collected the required amount. It was easy for them to cheat people and to demand too much money. As a result, tax collectors were typically rich people. What convinces you that that Mark believed Jesus taught a New and Better way to live? From what you know about Matthew, do you think that he believed his life was better after meeting Jesus? Why? What makes the change in direction of someone from a sinful life to a life living for Christ a new and excellent way to live? How do you convince those whom you meet that your life with Christ is a new and excellent way?